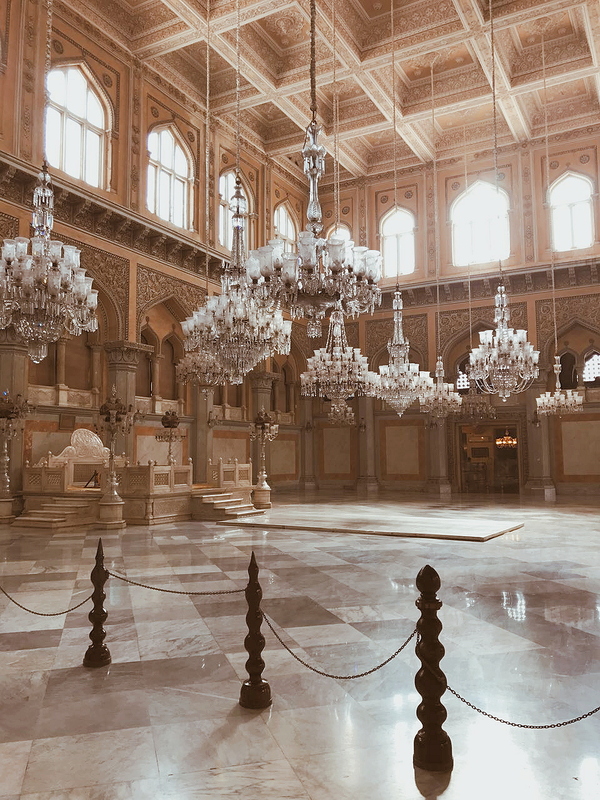 A lousy Saturday evening turned into an interesting one the moment I decided to pay a visit to Chowmahalla Palace. Having a little idea about the location of the palace it was a good idea to take cab. The palace is located at the southeast of the Laad Bazar, which is one of the most boisterous places in Hyderabad. Just to give you an idea, you can easily walk down to Char Minar from the palace. 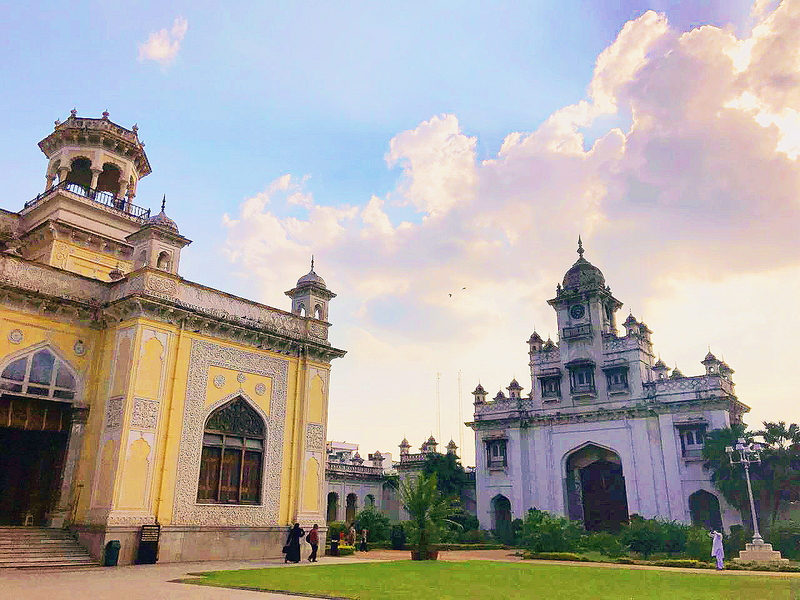 Chowmahalla Palace is one of the most sought after attractions in Hyderabad. 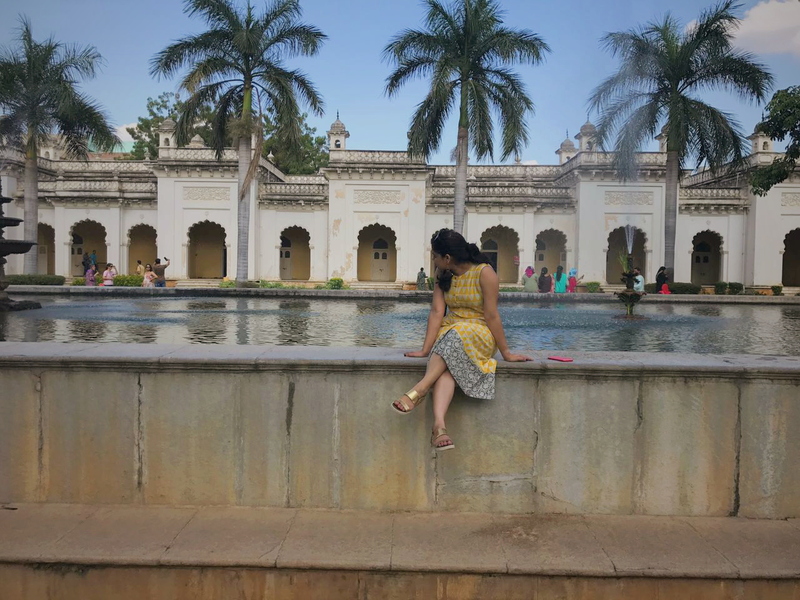 Even if you have a single day to spend in Hyderabad, this one is highly recommended. 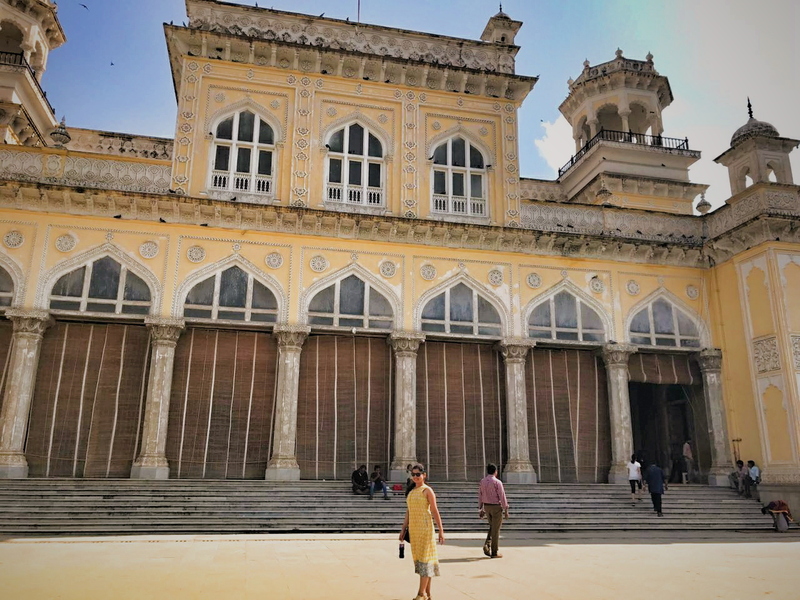 Chowmahalla Palace has a lot of intriguing stories wandering through the sky high walls of the palace. 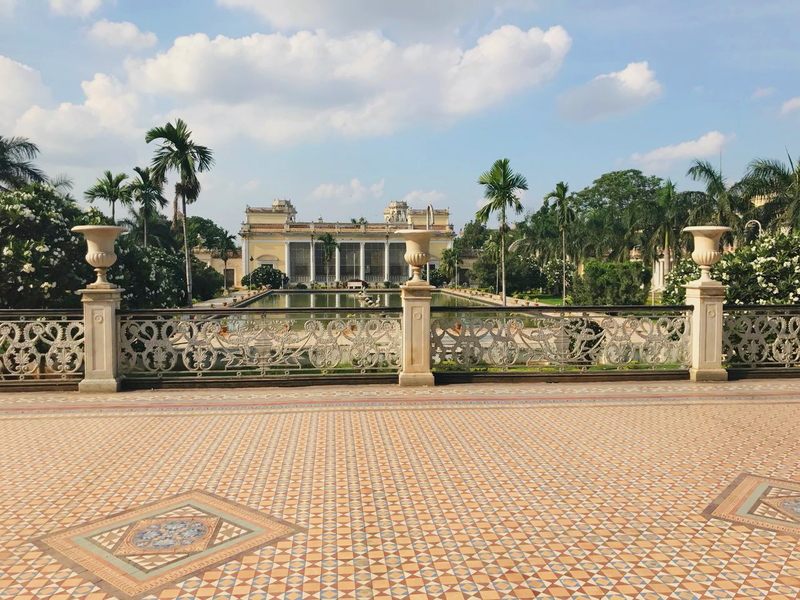 If you are keen to explore the history, facts and figures about the palace hire a guide from outside because no guides are available inside the palace. The moment you set your foot in the palace a palette of mind yellow, sky blue and green color welcomes you. Even the thought of palaces takes you to Rajasthan but this one is unique and different in its own regal ways. The architecture didn’t seem to reflect just one style. It is a perfect blend of Persian, Indo-Saracenic, Rajasthani and European styles. Southern and Northern courtyard is the major division of the palace, which further houses eclectic palaces, halls, fountains and gardens. Portmanteau of chow meaning chaar (four in English) and mahalla meaning mahal (palace in English), the name has Persian-Arabic origin. 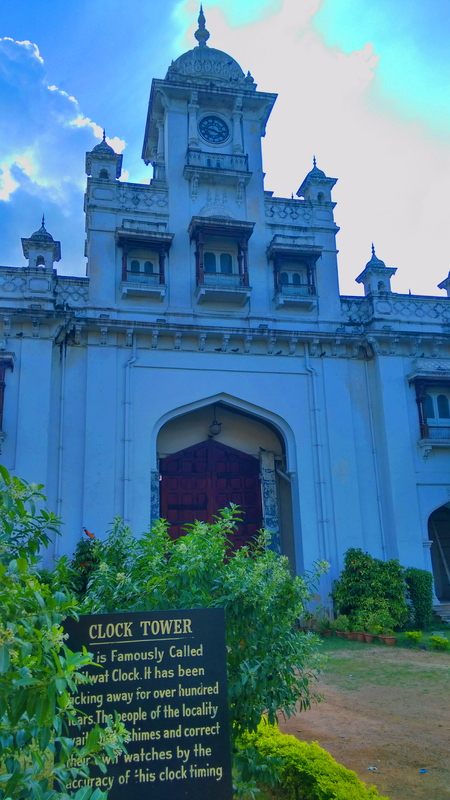 The palace officially belongs to Nizams of Hyderabad and during their ruling it was their official residence. Currently the Nizams come to visit the palace once in a year, they now live in Turkey. It is also believed that the palace’s model is inspired by Shah of Iran’s palace in Tehran. And hence the diversity in the architecture of the palace. The palace is sprawled across 14 acers which is approximately one third of its original area. Few parts of the palace couldn’t stand the test of time. While I hurriedly took tickets and stepped in, I decided to start with the northern courtyard which is majorly about Khilwat Mubarak. As you enter the palace you will notice a lot of small rooms dotted in the courtyard. Before you wander anything more about these let me tell you these are the servant quarters. Just as the courtyard ends you will witness an imposing mild yellow building which is known as Khilwat Mubarak. Khilwat Mubarak is considered to be the heart of the palace, as it was the seat of Asaf Jahi Dynasty. All the prestigious darbans, religious and symbolic ceremonies of the nizams used to happen right here. Oblivious of what’s inside I was blown away by the grandeur of Khilwat Mubarak. As I stepped in the hall I couldn’t help but fall in love with the nineteen life size Chandeliers of Belgian crystals across the whole hall. I wish I could being one of them home, but I doubt if they will fit anywhere in my house. Did you just see the size of it, it is insane. You can’t stop looking at them until you get a sprain in your neck. The hall has pure marble platforms and a lot of grand pillars spread across the whole hall. 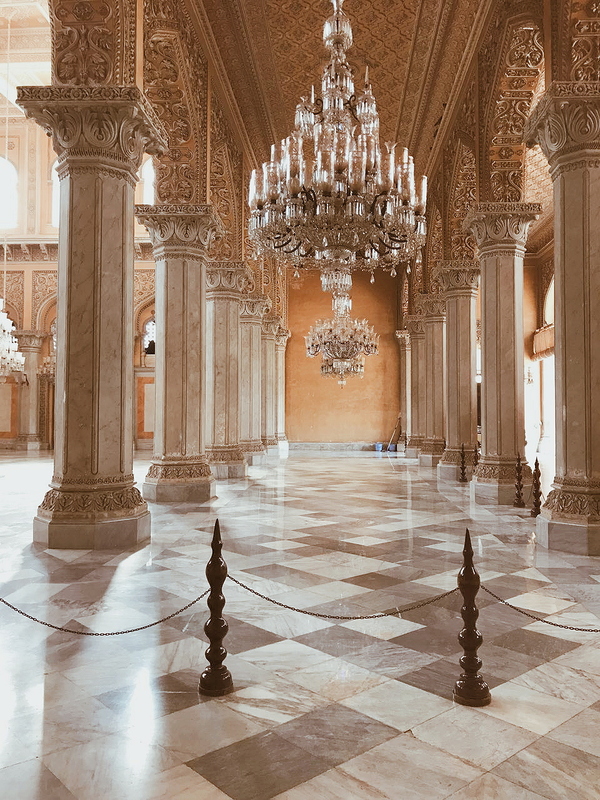 Another striking aspect of the hall is the Takhte-e-Nishan or the royal seat or the Throne of Nizam, I could easily picture some ceremony going on in the hall, with the nizam seated on the throne and rest seated in the hall. 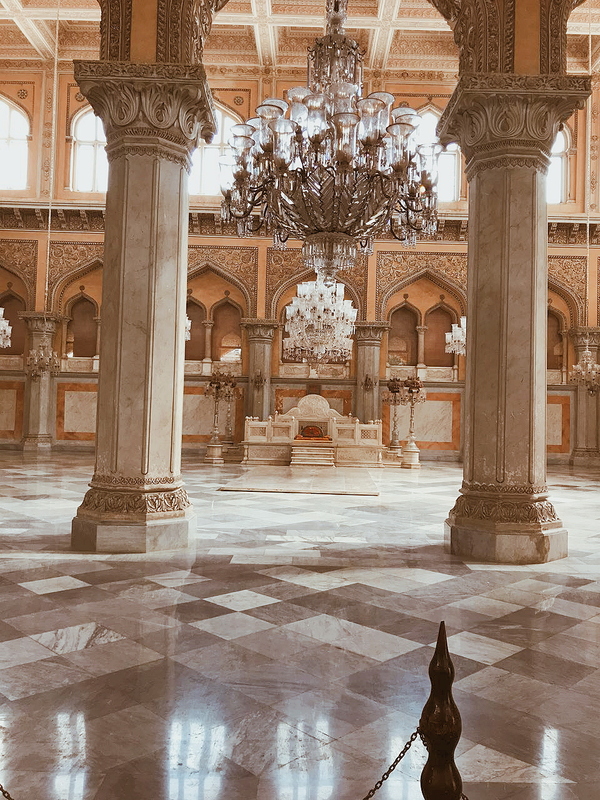 Khilwat Mubarak showcases balanced blend of Mughal and Persian architecture. The domes and arches of the hall screams Mughal era and elements like ornate stucco will remind you of Persian architecture. The mail hall leads to a small photo gallery which houses pictures of all the nizams of the palace. You can also see the photos of the current nizam and his whole family. As you exit this area you will find rooms exhibiting furniture, cutlery of nizams. Another intriguing part of Northern courtyard is Selaih Khana which houses all the arms and ammunition of Asaf Jahi Dynasty. On display are swords, knives, spears, axes, daggers, bow and arrows. 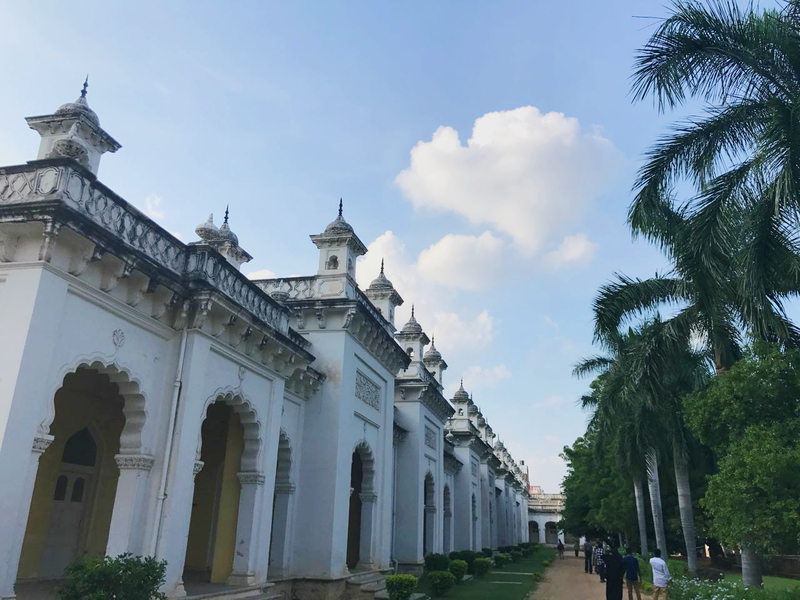 You will also see the flags of the erstwhile Nizam’s household infantry and personal bodyguards and uniforms of the Maisram Regiment soldiers. Right next to Khilwat Mubarak stands the tall clock tower, endearingly called as Khilwat Clock. This clock has been in action since past 250 years and the locals still use its time to correct their watch. Isn’t it amusing how people still trust the heritage and legacy over the new age technology? An expert family of clock repairers who operates from Lad Bazaar winds the mechanical clock every week to ensure its seamless functioning. The southern courtyard houses the four palaces Afzal Mahal, Mahtab Mahal, Tahniyat Mahal and Aftab Mahal which contributes to the name of the palace. 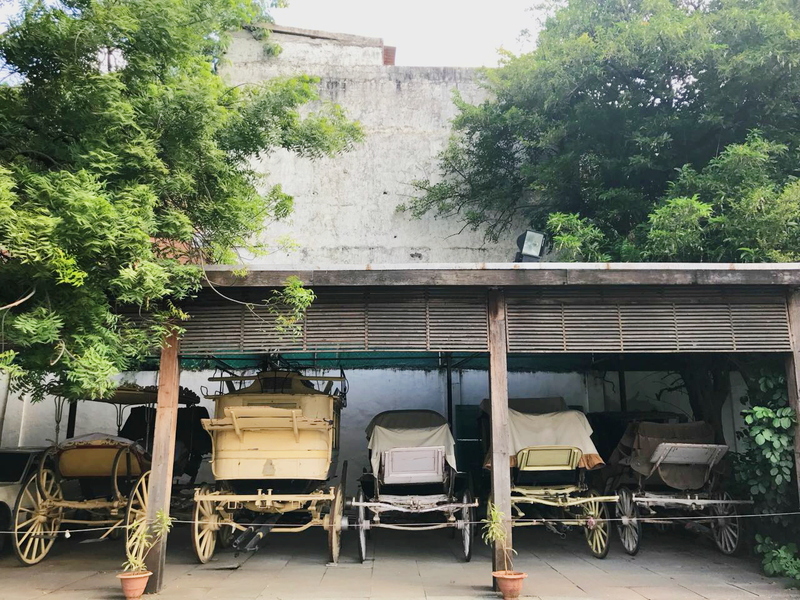 One of the palaces display belongings of sixth nizam ranging from his writing table, chair, personal stationary, vintage typewriter and urdu keyboard. The walls of the palace adorns vintage photograph, mirror and various other antique collections. Another palace displays clothes of women to give a glimpse of the zenana (women’s quarters) of those times. It was here I met with a group of people from Russia. They asked if they could join me, to which I happily said yes. The most prominent from the whole collection is the Rolls Royce Silver Ghost car which was made to order in 1911 with many custom features. It is intelligently placed first in the row of many vintage car and its rich canary yellow color grabs your attention in no time. The car’s hardware is modeled to reflect 1930’s style and it totally justifies it. This car is only used for ceremonial occasions and in those little movements it has recorded just 356 miles in the last ten years. 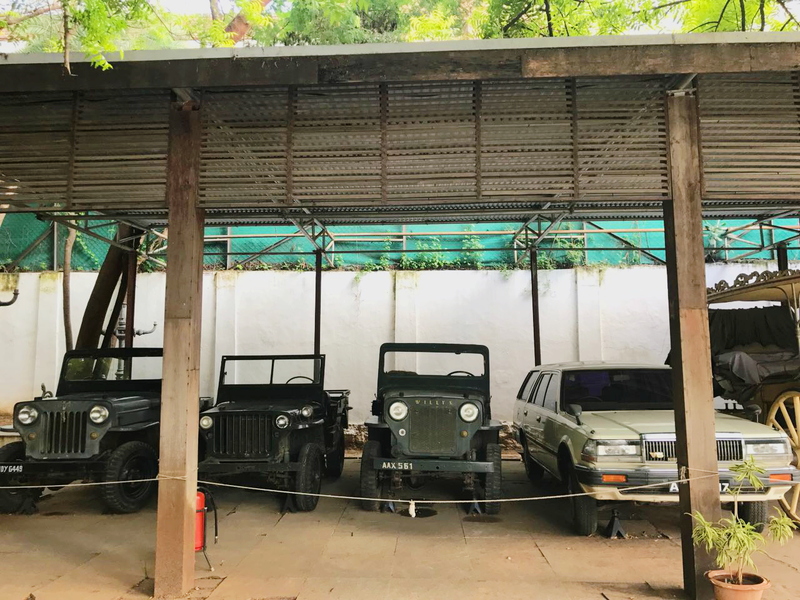 The car is not just a show stopper but it is a very important part of Indian Automotive Heritage. This car has participated in The Cartier Travel with Style Concour-de-Elegance held at Delhi in 2011. It now holds two titles “Best of Class” in the Rolls Royce category and “Best of Show the Concour de Elegance”. 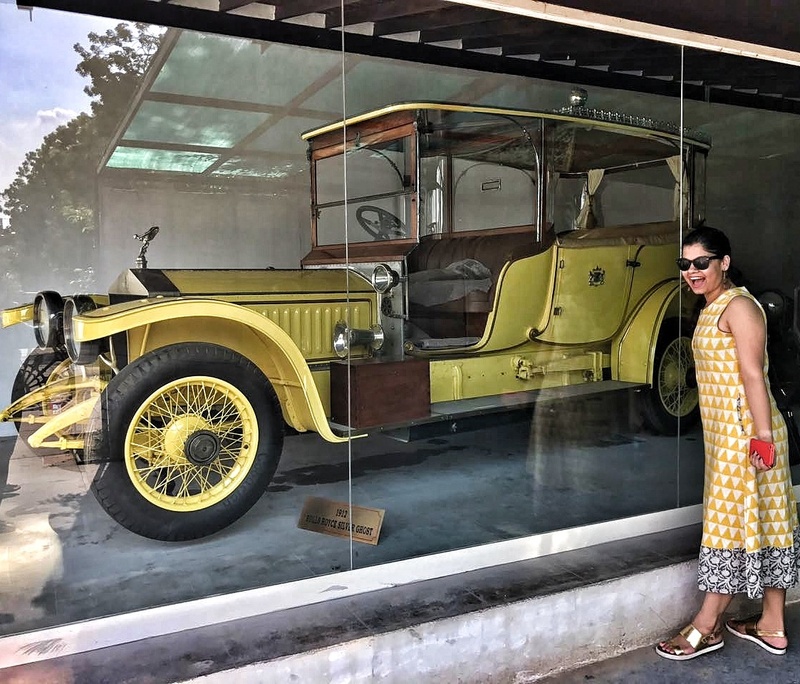 Rolls Royce Silver Ghost car is accompanied by many other impressive vintage car, you are tend to get stuck here if you have even little interest in vintage cars. What stands today as an imposing palace, was once at the verge of shattering. The credit for this resurrection goes to the first wife of the present nizam, Princess Esra. Esra met with her ex-husband in London at the wedding of their son Azmet. It was then she was apprised of the state of Jah’s affairs. Esra convinced Jah to give her a chance to save whatever was left of their heritage. Jah happily gave Esra the authority to move ahead. Esra then came to Hyderabad in 2001 with a renowned Indian lawyer Vijay Shankardass. She first settled various outstanding law cases. And then planned to turn Chowmahalla Palace into a museum and lease Falaknuma to a hotel chain. Her efforts lead to propitious results and six years later the palace was open to the public. The palace boasts more than 1000 visitors every day. A great number for a building which was once going to get extinct. Taj Group of hotels currently leases Falaknuma which is one of the most premium heritage hotels of India. 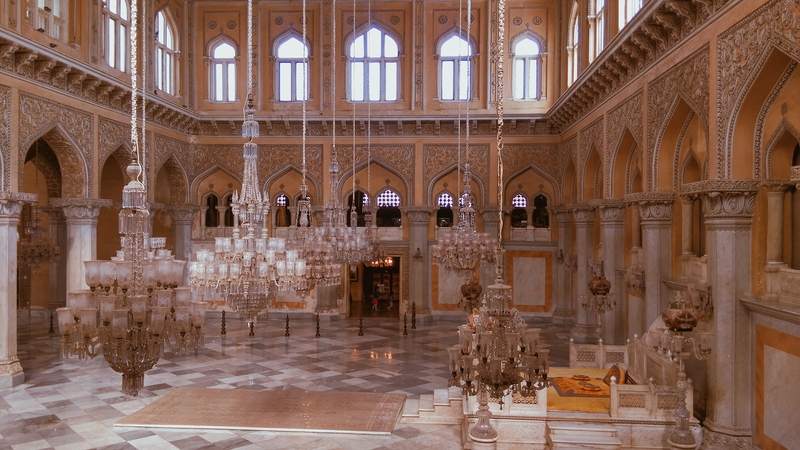 Chowmahalla Palace has stood the time of test and various other adversities. What we have today is nothing less than incredible. With these thoughts I left the palace and the Russian group left for leonia resorts. They were putting up there and had one more week to explore Hyderabad.